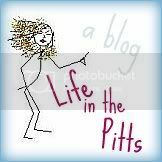 Life in the Pitts: I need better comebacks. I would have resorted to the middle finger comeback. My favorite was when I got out of the car at the grocery store and this mom and two teenage daughters had just walked out of the store. They were so stunned by my pregnancy, they stopped in the door and watched me walk into the store with this horrified expression on their faces. As if the baby was going to fall out of me on my walk in. It took everything I had not to bust out the middle finger comeback, but trust me. I wanted to so very, very badly. Some people are just rude. You are adorable. The one I wanted to tell the lady who said something similar to me was "I'm 36 weeks pregnant...what's YOUR excuse?" I feel your pain... With my first pregnancy, I got so big and so quick I had people asking me this question when I was only 5 1/2 months along. "I have 4 months to go, thank you". That pretty much shut them up. Public=people diagnosing me with twins. I blogged about that a few weeks ago. and at least since then my friends have stopped making large comments. "Actually, I'm having quintuplets! I'm looking pretty good!"